Four weeks from now, 6-year-old Goldikova will attempt to do something no horse—male or female—has ever accomplished: become a four-time Breeders’ Cup Mile winner. Coming in with a two-race losing streak obviously isn’t ideal, but the Anabaa mare loves the tighter turns of American turf courses like Churchill Downs, so it will be hard to discount her chances. Of all the Breeders’ Cup races, the turf Mile is probably my favorite open company affair, and since 1984, eight times it’s been won by a filly or mare. Before Goldikova, there was Six Perfections (2003), Ridgewood Pearl (1995), and two-time winner Miesque (1987, 1988), a brilliant racer and terrific broodmare who not only produced champion East of the Moon and dynamic sire Kingmambo, but a Breeders’ Cup Mile winner in (appropriately enough) Miesque’s Son. The first BC Mile winner Royal Heroine (1984) is one that perhaps has faded from people’s memories over the past two decades, but should not be forgotten—and not just because of her North American record-setting effort against a field that include Cozzene (who came back to win the race the following year). Her game effort in the G1 Arlington Million just before the Breeders’ Cup impresses me; after her jockey Fernando Toro made the unusual move of gunning her to the lead, the Lypheor filly led the boys on a merry chase until, in the final furlong she was passed by the legendary John Henry, making the 81st start of his illustrious career. 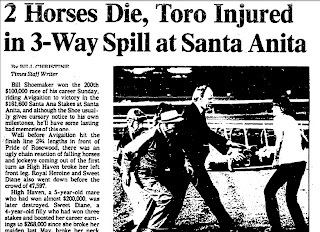 What makes Royal Heroine’s performance that year truly miraculous is the fact that six months earlier, in the G1 Santa Ana Stakes at Santa Anita, she had been involved in a three-horse spill—one in which Sweet Diane died instantly after breaking her neck and High Haven was later euthanized due to her broken left front leg. Fortunately, Royal Heroine suffered only minor cuts and severe body soreness, but Fernando Toro (who would also ride her to BC victory) was thrown and then kicked in the face by Royal Heroine as she attempted to rise from her knees. His physical ailments—lacerations and a concession—didn’t match the emotional trauma felt by jockey Ray Sibille who, although riding High Haven, was the regular rider of Sweet Diane (she was ridden by Laffit Pincay that fatal day). 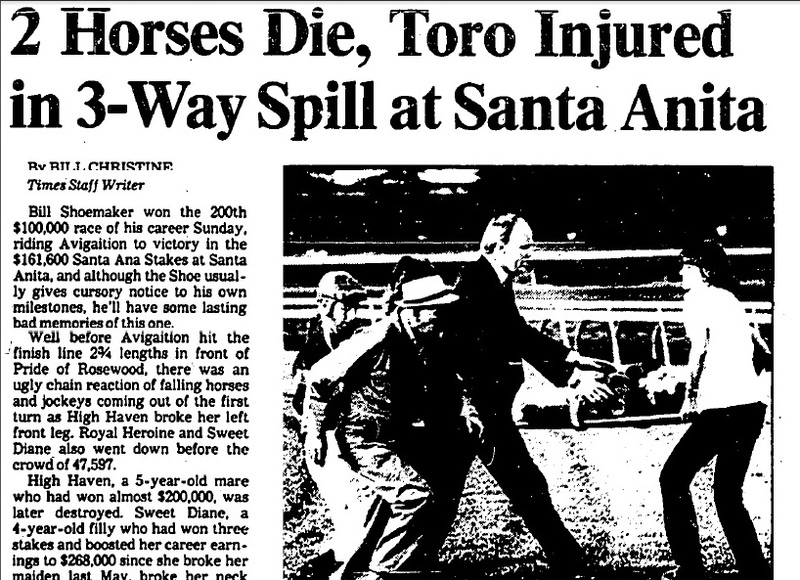 “2 Horses Die, Toro Injured in 3-Way Spill at Santa Anita” by Bill Christine, Los Angeles Times (March 19, 1984). After a three-month break, Royal Heroine made her return for trainer John Gosden a winning one, capturing the open company G3 Inglewood Handicap, and followed that up with a victory in the G2 Beverly Hills Handicap in July. Next, in the race prior to the Million, she was disqualified from first to third in the G3 Palomar at Del Mar. In her final prep for the Breeders’ Cup, Royal Heroine was upset by Flag De Lune, but then she put in that world record-matching time in the Mile, a record that had been set back in 1949. The final race of her career was a mere 15 days after her BC win, when she captured the G1 Matriarch over Sabin. 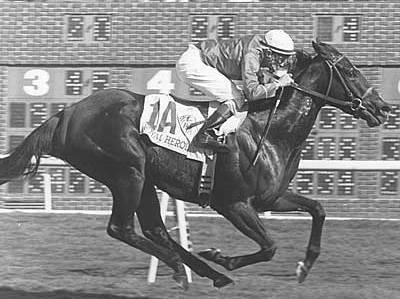 It was enough to make her the Eclipse-winning turf mare for 1984. She may not have been a Miesque—let alone a Goldikova—but Royal Heroine was one tough cookie.